Osteoblast and osteoclast activity is modulated by a number of hormones and cytokines. Imbalances in these modulators can lead to inefficient remodeling, excessive osteoclast activity, and eventually, osteoporosis. A protein called receptor activator of nuclear factor-κβ ligand (RANKL) has been found to play a pivotal role in stimulating osteoclast activity. RANKL production is increased by the hormonal changes seen in menopause. It is inhibited by a protein called osteoprotegerin (OPG). 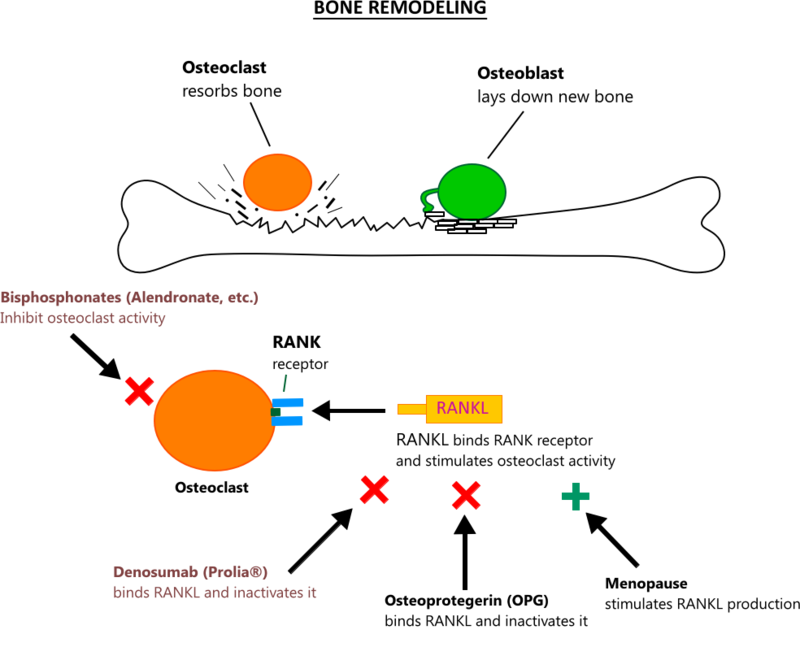 The osteoporosis drug denosumab binds RANKL and inactivates it. Osteopenia is a milder form of bone loss than osteoporosis. In DXA scanning, osteopenia is defined as a T-score between -1.0 and -2.5. The risk/benefit of pharmacological treatment in patients with osteopenia has not been validated in large trials. Current guidelines recommend treating patients with osteopenia who are at increased risk of fracture. Increased risk is defined as a 10-year risk of ≥ 3% for a hip fracture or ≥ 20% for major osteoporosis-related fracture based on the FRAX tool. Celiac disease, inflammatory bowel disease, gastric bypass, etc. ACR recommendations for treatment and prevention of glucocorticoid-induced OP. Recommendations are for patients receiving long-term glucocorticoids defined as ≥ 2.5 mg/day for ≥ 3 months. Calcium is the primary mineral found in bone. The skeleton contains 99% of the body's calcium stores.